Join Saveur the Journey for a Skiing/boarding trip to the ultimate powder stash, Niseko, Japan! Float effortlessly through some of the driest, deepest snow in the world, while experiencing the decadent delights of Japanese hot spring baths (onsen), the rich and delicious culinary traditions, and amazing hospitality. The snowflakes are softly building into a deep, light blanket, the yakitori is sizzling above the binchotan charcoal, fresh fish is being turned into sushi by a master with forty years’ experience, the onsen is sending clouds of steam into the snow-filled ski. We are going to Japan, are you coming? Guides who are passionate about Japan and Skiing/Boarding. Don’t speak the language? We have you covered! Hokkaido, Japan’s northernmost main island receives amazing amounts (45 feet on average!) of some of the driest snow on the planet. In the midst of this giant snow party is Niseko, perhaps Japan’s most famous ski area, featuring numerous resorts, fantastic terrain, fast lifts, and acres of powder. Skiing/boarding through knee, waist, and even neck deep powder is not uncommon (see video)! 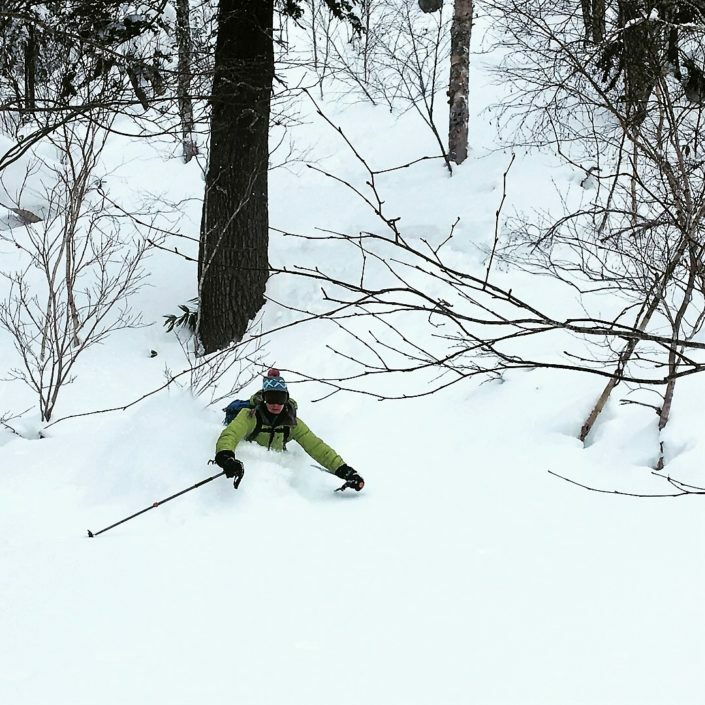 Japan is also famous for its excellent tree skiing/riding through beautifully spaced birch and alder forests. Apres ski, Japan has a strong culture of bathing in thermal hot springs (onsen) baths. Finishing a day on the mountain with a hot soak surrounded by snow is the Japanese way. 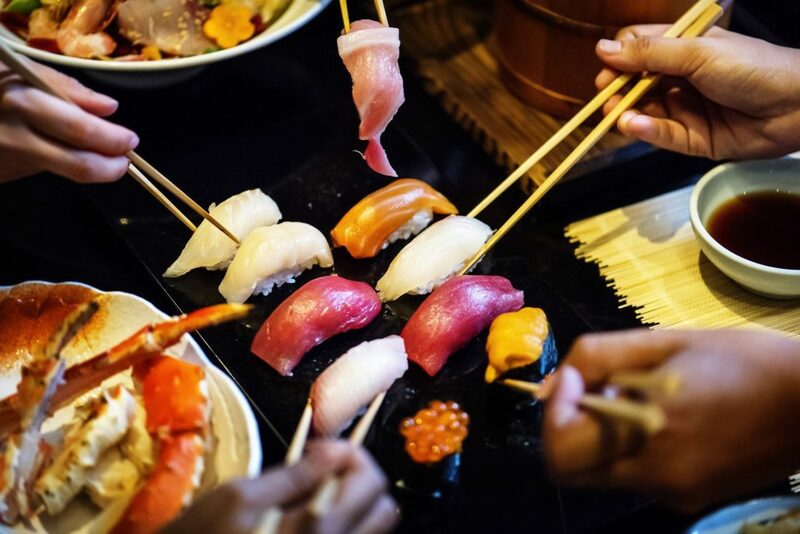 Japan boasts the largest number of Michelin starred restaurants per capita – and has one of most enviable and refined cuisine in the world. Hokkaido’s cold waters are renowned for the high quality and freshness of its seafood. The ramen in Hokkaido is unique with a miso based broth around Sapporo, salt broth (shio) from Hokadate, and finally soy (shoyu) from Asahikawa. We will even try the hearty and soon-to-be famous soup curry. 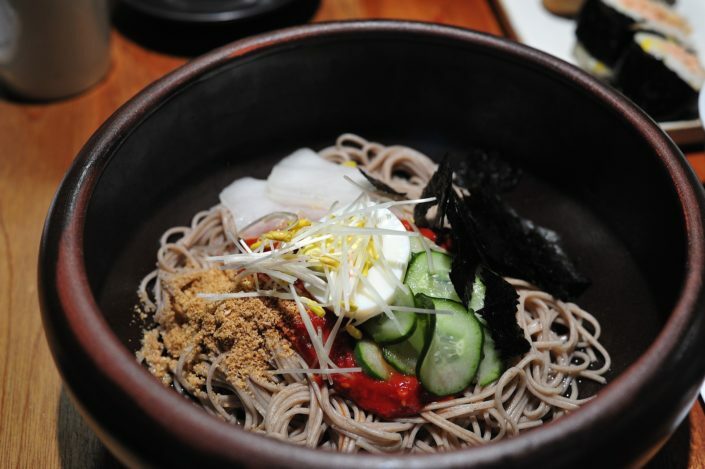 If you are a ramen fan, you will be thrilled to try this special, under-the-radar specialty of the northern prefecture. “Jingisukan” (Genghis Khan) is a convivial dish from Hokkaido consisting of lamb and vegetables cooked on a dome shaped metal grill in the middle of the table. After cooking, the meat is dipped in a soy based sauce and eaten right off the grill. 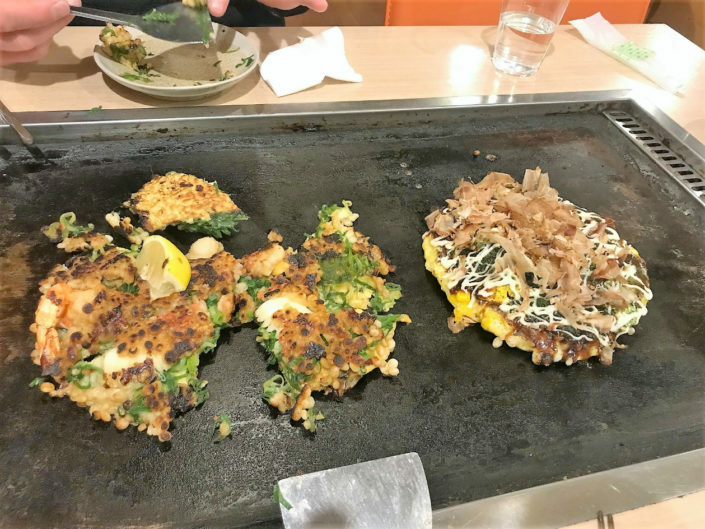 Japan has a huge culture of informal drinking and small plate restaurants called “Izakaya.” Here you can eat platefuls of gyoza (dumplings), Japanese fried chicken, yakitori (grilled skewers), noodles, soups, sashimi, sushi and wash it all down with cold Japanese beer, sake, or Japanese whiskey. Every day after a hard day on the slopes, we’ll visit one of the many beautifully landscaped Japanese onsen. These natural hot springs are often found in natural settings, among mountains and rivers, and they are the perfect place for quiet soaking, relaxation, and contemplation. Winter, with its powdered snow landscapes is arguably the best time to bathe in a hot outdoor bath (Roten-buro). Located an hour and a half from Niseko, the romantic port town of Otaru is steeped in a rich history that dates back to its glory days as a major herring center. We will take a break from skiing/boarding for a day to wander the canal district and check out centuries-old glass blowing shops famous for blowing balls meant to hang squid nets. 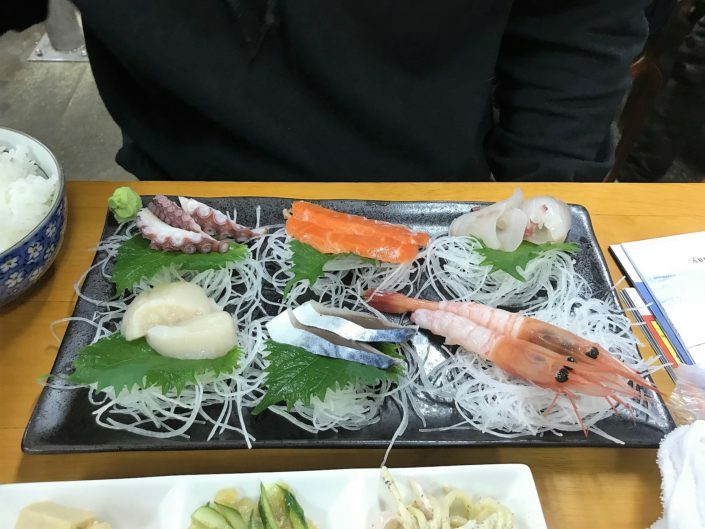 Otaru is known for the freshness and quality of its sushi. We will eat fresh seafood and even sample soft serve ice cream made from Hokkaido milk (including some odd flavors, e.g., uni, beer, potato). 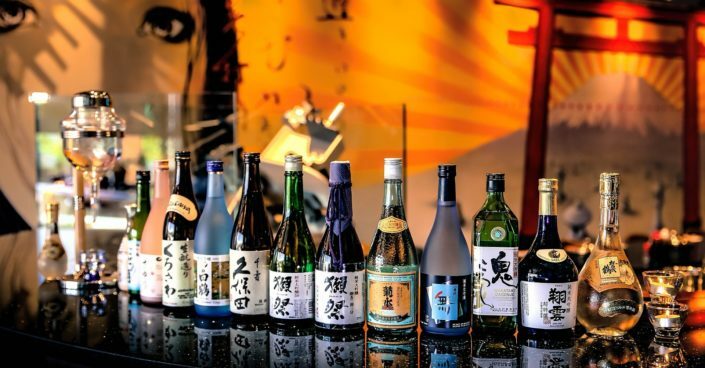 Japan is famous for its rice wine (sake) but also for producing some of the best whiskeys in the world. We will have the option to visit, tour, and taste our way through the Tanaka Sake brewery or Nikka Whiskey Yoichi Distillery (founded in 1934). 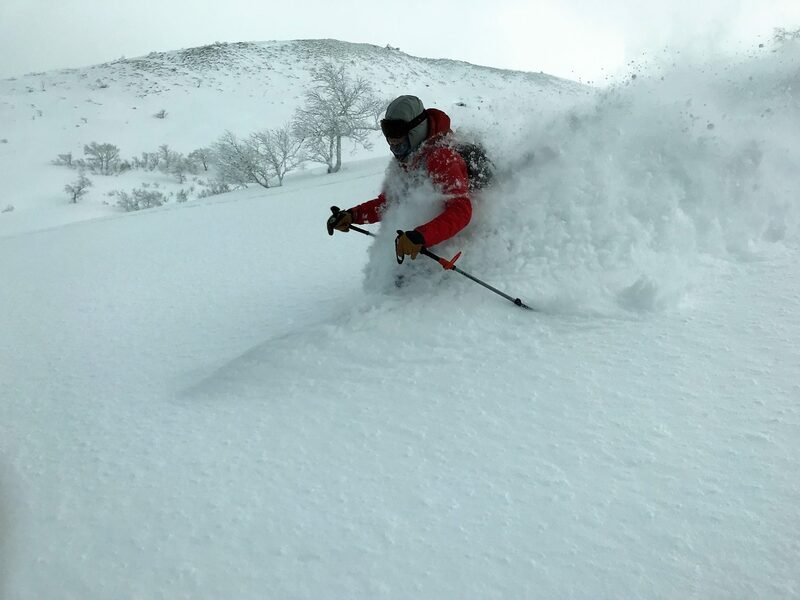 For the ultimate JapPow (Japanese Powder) experience join us on an optional backcountry guided tour or a day of Cat Skiing/boarding. Whether you want human powered ascents to reach untouched powder fields, bowls, and glades or the thrill of riding a snow cat and lots of fresh powder runs we have something for you. Nestled on the backside of Mt. 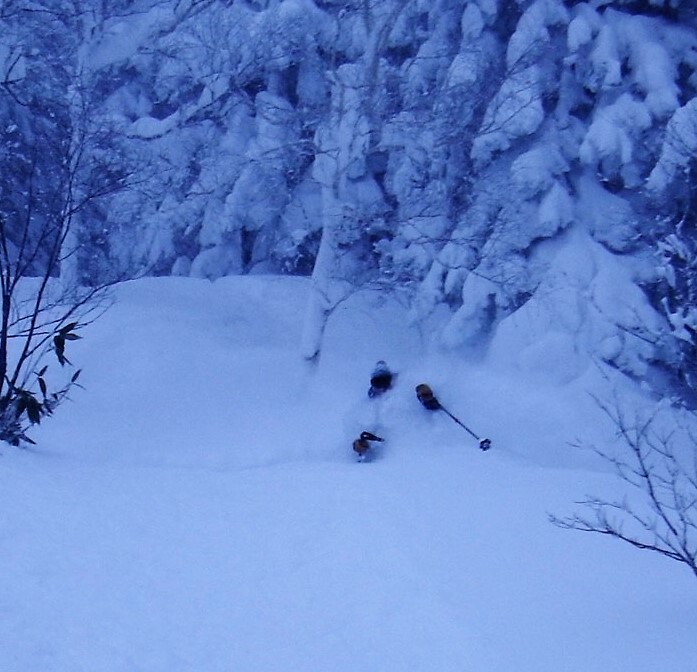 Annupuri, Goshiki Onsen provides access to a whole range of backcountry zones. Low angle trees, steep pillow lines, wide open bowls and peaks to hike all wait at the end of Hwy 58. Choose to spend the day lapping the bowl right off the parking lot for quick, blower pow runs or adventure out to the high alpine world of Mt. Annupuri for extended untracked laps. Finish the day off with a soak in Goshiki Onsen, and experience one of the greatest combinations of culture and adventure Japan has to offer. Once we get to Niseko, we will all stay together in a beautiful and comfortable chalet where we’ll have home cooked Japanese/Western breakfasts. We will also share a few meals together at “home,” learning how things are made and helping you bring some cooking tips home with you. In the twilight the snowflakes fall thick and fast. Steam rises from the hot water of the onsen, reaching up to mingle with the falling snow. Muscles relax, powder exploits are shared, and appetites build. 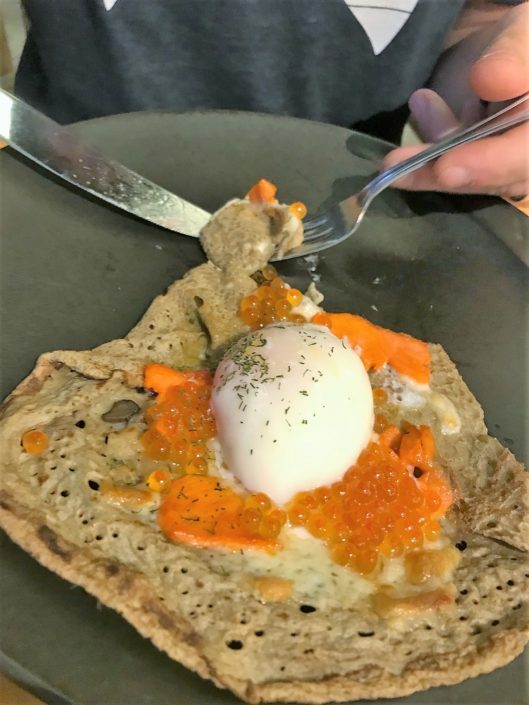 In a restaurant nearby the bounty of Hokkaido is transformed into loving and exacting dishes, layered with color, texture, flavor, and umami. After Sake and Sapporo it is time to rest, tomorrow will bring staggering quantities of snow, new dishes, new friends, and memories that will remain as fresh as the powder. This day is optional and is on your own. Arrive at New Chitose Airport in Sapporo, Japan. Check into hotel , rest and relax or explore Chitose or Sapporo on your own. Do you have to be an experienced skier/snowboarder to go on this trip? You must be an intermediate or better skier/snowboarder. You should have previous experience with skiing in POWDER and have suitable all mountain (105+mm underfoot) or powder skis (115mm underfoot or wider) or snowboard. No! Speaking Japanese is definitely an asset but not at all required. Many Japanese people don’t speak English but our Japanese speaking guides will provide translation, organize logistics, get us to the interesting spots, and help you enjoy your experience. What if I don’t like Sushi? Sushi is only one part of the amazing Japanese cuisine. If you don’t like raw fish never fear! 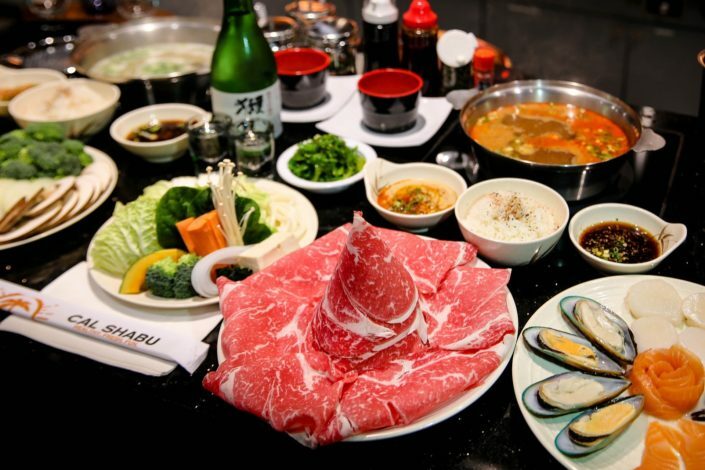 Japan is known for delicious and varied cuisine including yakitori (meat grilled on skewers), Tempura, yakisoba (stir-fried buckwheat noodles), seared fish, regional ramens, grilled and roasted meats, simmered vegetables, and much more. Niseko has some of the lightest, driest, snow on the planet which means that it stays cold. Temperatures in January are generally in the high teens and low 20’s Fahrenheit but can be colder. Dressing with layers is important to stay warm. To get so much snow there has to be storms so expect stormy days with lots of snow falling! What is chalet like, what are the rooms like? The beautiful chalet is made from massive local Karamatsu logs and is located in a secluded spot, yet still close to Annupuri and Niseko Village Ski resort. The chalet has 5 bedrooms including a Japanese style tatami room and a loft. There are two bedrooms with two double beds in each, plus a master bedroom with a king bed, attached bathroom, and room for two futons. There is lots of open communal space, a piano, a traditional hinoki bath, a large oak table, and an enclosed Finnish masonry fireplace. Can I share a room at the chalet? Is it possible to have my own room? 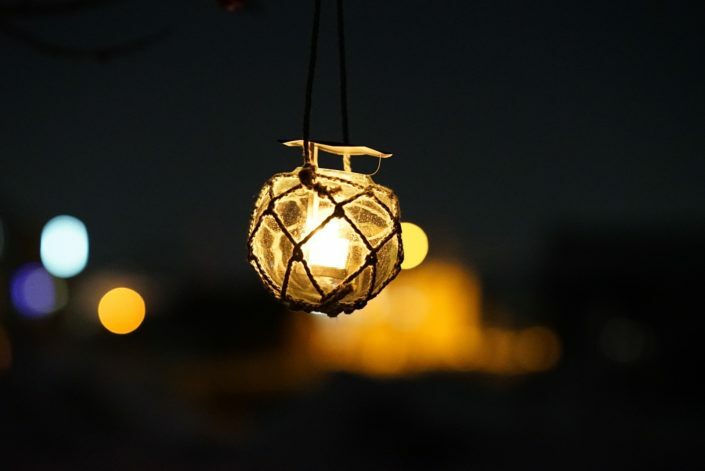 Yes it is possible to share a room at the chalet, either with someone you already know (please let us know) or with someone else on the trip who is willing to share. If you would like to have your own room it may be possible based on availability. There is a $500 single supplement fee for a Japanese style room and $1200 single supplement fee for a western style room. Should I bring my own gear or are there rentals available? We recommend that you bring your own gear, providing that you have suitable powder snowboard or skis (all mountain skis in the 105-110mm width or powder skis 115mm or wider). There are rentals available but it is not guaranteed that they will have your sizes or brands. Bringing your own boots and renting powder skis or snowboard is probably a safe bet. Avalanche safety equipment is required for backcountry riding and rentals are available as well. I have dietary restrictions, can you accommodate me? Please contact us to let us know about your dietary restrictions to see if you can be accommodated. I don’t know how to use chopsticks and I am worried I will injure myself if I try to learn. Will I still be able to eat? While chopsticks are used for much of the eating we will do in Japan, forks will be available, so no one will go hungry. We will happily help train you in the ways of chopsticks if you so desire! How much does the optional Backcountry Skiing/Snowboarding day cost, and what does it include? Please add $150 for the guided backcountry ski/snowboard touring day which includes transportation to the mountain, guides, packed lunch and lessons on backcountry safety and travel. Please add $450 for a day of cat skiing/boarding which includes avalanche safety gear, lunch, transportation to mountain and guides. If you need to cancel a trip that you have already booked and it is at least 90 days before the start of the trip your deposit is fully refundable. Final payment for the trip is due 60 days before the start of the trip. Cancellations between 30 and 59 days before the of start of trip that cannot be filled are 50% refundable, if your spot is filled then it is 25% refundable. Cancellations less than 30 days are non-refundable (100% of booking cost). For this reason, we recommend you consider purchasing travelers insurance, (try World Nomads) which will cover the cost of your trip in extenuating circumstances. Aaron Schorsch is the owner of Saveur the Journey where he combines his passions of food, travel, outdoor adventures, and culture. He grew up in rural New Hampshire and has lived and traveled extensively in the US and abroad. 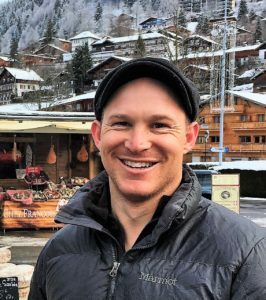 Aaron learned to snowboard while teaching English in the French Alps but later took up Telemark Skiing. While he still likes to drop a knee on occasion you are more likely to find him with fixed heels shredding the backcountry or resort in a style he likes to call “joyful abandon.” Aaron is a student of food who has worked throughout the food system from growing seed and farming of vegetables, fruits, and livestock to cooking in high end restaurants and managing farmer’s markets. He loves to talk about, think about, dream about and especially, cook and eat food. He is a member of Slow Food international and has been a US delegate at Terra Madre in Turin, Italy. Having spent two years as the only foreigner in a small Japanese town, Victoria has plenty of experience figuring out how things work in the far east. 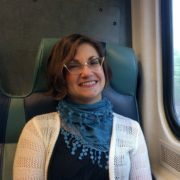 Victoria studied Chemistry and Japanese at NYU and took off after graduation to teach English abroad. It was her Japanese countryside “inaka” education that gave Victoria a real flavor of Japan and she is still famous for her Taiko playing skills down south. Victoria especially loves eating and bathing in Japan and has extensive experience traveling around to try new things. Victoria is very excited to show Saveur the Journey “her” Japan and introduce everyone to the quirks that make Japan so special.